“Select baseball’s a small town. Everyone knows everyone else’s business.” (p. 163). For Sam’s mother, Shannon, it’s all about getting him the opportunities to excel. If that means Sam gets more pitching practice and coaching time and is better than many of the other baseball mom’s kids, then all the better. Summer is fast approaching and Sam wants to try out for travel baseball. Both Sam and his mother will discover that there’s more competition off the field than on it and that baseball has its own set of politics and unfairness. All Sam wants to do is play, but what does Shannon really want? What is she willing to do and to let go of for her son? Even though I don’t have kids and have never played baseball, I could relate to the mother in this book. She had her ups and downs. She was harried and busy. Sometimes she didn’t even have time to properly eat or sleep. The way she complains about anything that went wrong was hilarious and always in perspective of her son’s happiness. She was an endearing, yet flawed, character. There were some great one line zingers in this book. Like, “Sometimes relationships you think are friendships turn out to be tools only to get you through the week.” (Page 222) and, “At least with sports, the competition was direct and the winners and losers obvious.” (Page 235). Keeping Score was like Ready Player One and its constant over-the-head 80’s pop and game references but with technical baseball terms and lingo. Much of this went over my head and I focused in on the story and the relationships between the characters. The technical baseball terms and phrases did not detract from the story being told. This book is for mothers everywhere, especially anyone who knows anything about baseball. 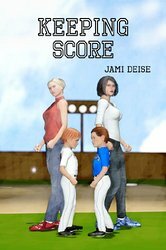 Also for those who want to know precisely what it’s like to be a sports mom or anyone who wants to read a fast-paced fun book about mothers, baseball, and the highly competitive nature of parenting. This novel was published by Amazon Digital Services January 13th, 2014 and is available on Amazon here.